High Profitability. Extensive research details a return premium associated with corporate profitability, measured by metrics such as operating profitability, return on equity, and return on assets.10 Novy-Marx (2013) suggested that the so-called profitability anomaly (labeled as such because it defies the efficient market hypothesis) results from investors’ limited attention, a form of cognitive and behavioral bias. Low Investment. Discipline to avoid superfluous corporate investments—particularly by profitable companies—is a key attribute from the perspective of good governance, one associated with superior performance. For instance, Brightman, Clements, and Kalesnik (2017) studied “sustainable” businesses, those companies with the discipline to return earnings to investors in the absence of attractive NPV projects. In contrast, “unsustainable” companies, such as Compaq and Yahoo in recent decades, tend to fuel aggressive investments with excessive stock and debt issuance at the height of their profitability and to expand in ways that damage their competitive advantage in fields they had previously dominated.11 Eventually such companies’ bottom lines suffer from ill-conceived investments and expansions, and their shareholders pay the price. Low Issuance. Empirical studies consistently document a negative relationship between net issuance and subsequent stock performance.12 The exact causality has not been isolated in the extant literature, although experience suggests firms that are issuing extra shares may either possess private information about their stock price’s near-term overvaluation or, as just described, are issuing shares and debt to finance poor-NPV projects. In addition to the rapidly growing recognition of the social benefits of diversity and inclusion,14 a large and expanding body of research shows that a broad range of benefits—including better financial outcomes—accrue to companies who build and nurture diverse and inclusive teams. The business case for diversity is grounded in research showing that teams whose members represent a mix of gender, ethnicity, experience, age, and culture, among other traits, and who purposely cultivate inclusiveness, tend to make better decisions because they are able to achieve a higher level of Collective Intelligence (CI).15 High-CI teams do not just happen: assembling a group of people, all individually highly intelligent, does not automatically create a “smart” team; the goal is to create teams who represent diversity in reasoning and whose members respect and value the perspectives of others on the team. Research shows that diversity has a positive impact on business outcomes—in particular, improved financial strength, higher net margins, higher compound annual growth rates, higher valuations, more frequent product innovation, and fewer instances of governance-related controversies.16 Gender diversity has been more closely studied than other forms of diversity because of greater data availability. While a number of studies have found that corporations benefit from greater gender equality,17 a handful have found an inconclusive or ambiguous relationship between a firm’s financial performance and the presence of women in leadership roles.18 These latter findings are not surprising given that research into CI shows diversity alone is insufficient to unlock the performance potential in team decision making. While it is not possible (yet) to directly measure the CI of a firm, the existing body of research provides substantial support for our conclusion that firms scoring well on existing measures of diversity, starting with gender diversity, are likely best positioned to produce the strongest long-run financial results. 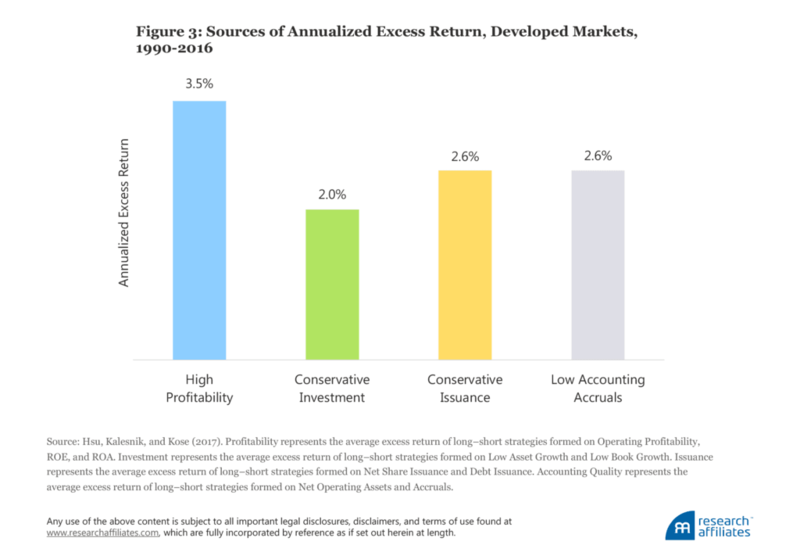 The majority of the research on diversity points to stronger bottom lines, measured by higher earnings before interest and taxes (EBIT),19 for example, rather than to higher long-run stock returns. Unlike financial outcomes, which can be studied in the cross-section of companies, a robust study of investment returns requires a long time-series; therefore, the shorter historical samples on which researchers have studied the connection between diversity and investment returns can only be suggestive at best.20 That being said, the links among corporate management, financial outcomes, and long-run investment returns are well researched, as previously discussed in relation to financial discipline. Given that the literature on diversity points to better corporate outcomes, we can view diversity as a natural complement to the empirically studied return drivers associated with financial discipline. Finally, the public statements and admonishments (a combination of carrots and sticks) that have recently been delivered by prominent pension fund sponsors and major global asset managers lead us to believe that the ESG-preference dividend is most acutely applicable to the issue of diversity, and gender diversity in particular. As a result, investors may anticipate a transition path over which higher returns accrue to higher-diversity companies and all companies rationally seek greater diversity among their ranks.23 Investors may benefit from embracing diversity metrics in ESG strategies in the pursuit of superior investment returns through this additional channel. 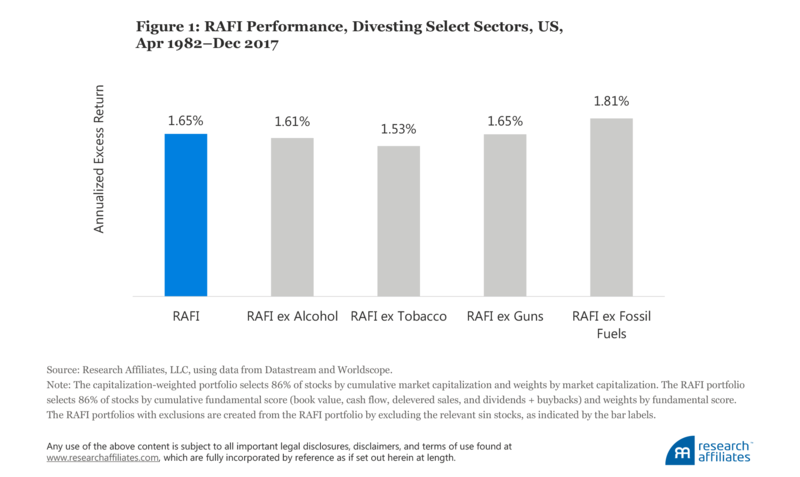 In addition to enhancing traditional ESG metrics with return drivers closely linked to corporate governance, such as those associated with financial discipline and diversity, the use of smart-beta portfolio methods—which start, we believe, with breaking the link between price and portfolio weight—can generate an additional source of outperformance in the form of a rebalancing return. In our view, the largest and most persistent active investment opportunity arises from long-horizon mean reversion (Brightman, Treussard, and Masturzo, 2014), and the systematic rebalancing of portfolio positions to stable anchor weights, which do not move in unison with stock prices, is the mechanism through which investors are able to benefit from this opportunity.24 Breaking the link between portfolio weights and stock prices protects portfolios from the approximate 200-basis-point return drag associated with the tendency of capitalization-weighted indices to overweight expensive companies (after price run-ups) and underweight inexpensive companies (after price declines) (Arnott, Hsu, and Moore, 2005). 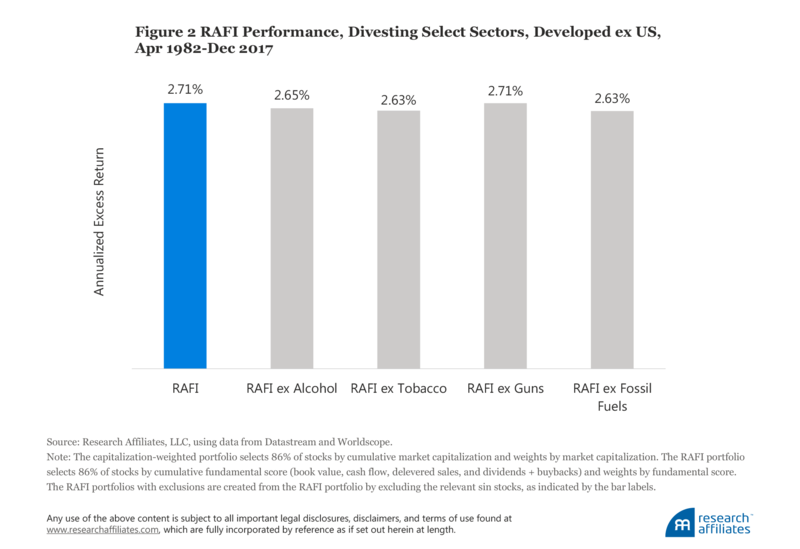 For over 10 years, Research Affiliates has used accounting metrics—in particular, cash flow, dividends, book value, and sales—to fundamentally weight index portfolios, turning the return drag of cap-weighted benchmarks into a return advantage for our RAFI indices, while retaining the benefits of allocating more capital to larger, and therefore easier to trade, companies. In addition, these four accounting metrics are simple, transparent, and consistent with accounting standards around the globe.25 The key smart-beta design elements characteristic of Research Affiliates’ strategies are applicable to an ESG strategy that relies on fundamental weights as the baseline for portfolio construction.